The lens that could shrink your camera Jump to media player Engineers at the California Institute of Technology are working on creating super-thin lenses. The car that transforms at speed Jump to media player BBC Click's Dan Simmons looks at some of the best of the week's technology news. What does VR need to survive? Jump to media player Crytek's director of production has spoken about the qualities needed for virtual reality to take off. The VR camera that costs $15,000 Jump to media player BBC Click's LJ Rich looks at some of the best of the week's technology news. Exploring a war zone in 360 degrees Jump to media player Filmmaker Christian Stephen has made what he claims to be the world's first war zone filmed in 360 degree video. 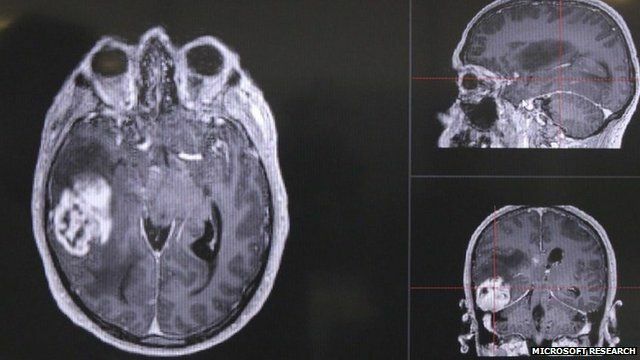 Microsoft Research says it is close to perfecting software that can measure tumours accurately in 3D from normal Computerised Tomography (CT) scans. The job of determining the extent of tumours is currently done by hand with limited accuracy. The "Inner Eye" project could make the process 40 times quicker and suggest treatments that could prove the most effective. BBC Click's Dan Simmons visited the Microsoft Research centre in Cambridge, UK to see it in action.